Diego Rossi was the hero at Audi Field with his first career MLS hat-trick, helping lead his side to their third win in a row. The visitors went ahead in the 15th minute through former Arsenal striker Carlos Vela, and Rossi netted his first of the night 12 minutes later with a decisive strike low into the bottom corner. The 21-year-old got his second before half-time and took advantage of a 10-man United to complete his hat-trick in the 76th minute. 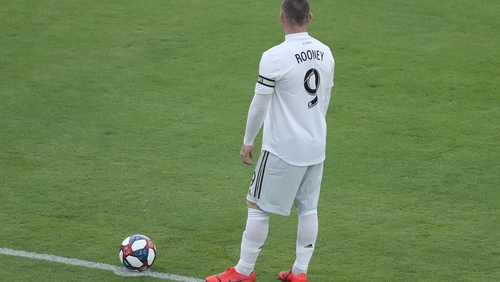 Rooney looked as though he would initially receive a yellow card for a tackle on Rossi, but was sent off in the 52nd minute after a VAR review, further adding to DC's torrid night as they suffered a first loss of the season. San Jose Earthquakes picked up their first points of the season with a 3-0 win against the Portland Timbers. Shea Salinas, Danny Hoesen and Cristian Espinoza all found the target in the first half, while Daniel Vega recorded his first clean sheet of the season. The Columbus Crew moved into first place in the Eastern Conference thanks to a 1-0 win over the New England Revolution courtesy of Josh Williams' goal. Orlando City's Nani converted a late penalty to edge out the Colorado Rapids 4-3, while Alejandro Bedoya's stoppage-time goal earned the Philadelphia Union a 2-1 win over FC Dallas. Elsewhere, Jonathan Osorio salvaged a point for Toronto FC as they drew 2-2 with the Chicago Fire, Abu Danladi and Romario Ibarra scored in Minnesota United's 2-1 victory against the New York Red Bulls, and the Montreal Impact's encounter against New York City finished goalless.